Visit the Anniversary Party Kick-Off Blog Party at LASR!! It's being held here, and at the WC guest blog. 80 authors in all shapes, sizes and genres will be sharing over the next couple of days about love, writing, life and more. Have fun reading the posts. But ... even better? YOU CAN WIN BIG. Every comment earns you an entry. 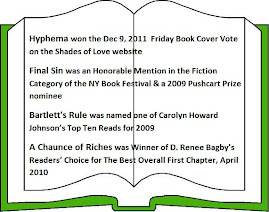 Winners choice of either a B&W Nook, a WiFi Kindle or a $150 Amazon or Barnes and Noble GC! Plus... they'll randomly give out $5 GCs to commenters throughout each day -- and winning a smaller prize doesn't exclude you from the Grand Prize Drawing. They're partying all month, too -- more chances to win eReaders and GCs abound. Check out all the details here. So... Visit the blogs all day long and comment. Fun AND prizes! What more could you want? I was raised in apartment 2D in the Bronx – our move to apartment 2G (in the same building) when I was eleven was a monumental change in my life as my parents moved off the sofabed in the livingroom into a bedroom of their own. My sister and I helped paint our new livingroom with one-inch wide paintbrushes – nothing was impossible. Growing up was always an adventure for me, especially with an imagination as active as mine was. I remember three strangers to our neighborhood that mysteriously disappeared into the basement of the building next door on an almost daily basis. One day, a daring friend and I crept down after them to observe what they were doing. They had clips and wires coming out of the building’s telephone junction box! Convinced that we had discovered some huge international espionage plot, we were giddy with excitement. When they turned in our direction, we ran, frightened for our very lives. That was the last time we ever saw them. As if I needed any encouragement into the world of make-believe, I studied Theatre Arts and Drama at the High School of Art and Design, Fordham University and the New York Academy of Dramatic Arts. After some humble, probably annoying, pleading, I managed a nondescript and all too short walk-on in the movie “Plaza Suite” starring Walter Matthau and Maureen Stapleton (How many degrees to Kevin Bacon?). I appeared (very far off) off-off Broadway and did a summer stint as a lighting technician at the Lake Placid Center for Performing Arts. I also worked my way through college as an undercover retail fraud investigator. My parents believed in mandatory community service although the choice of what we did was up to us. My sister was a Candy Striper at the local hospital, I joined the New York City Auxiliary Police at our local precinct – my dad was the Auxiliary Police Captain. That’s where I met my husband, at least REALLY met him. We had gone to the same high school (he studied photography) but my only vague memory of him was when he, in the guise of a by-the-book hall monitor, tried to prevent me from going to the backstage area to work on an upcoming play. True, it was between class periods and I didn’t have a hall pass, but the theatre students were used to making their own rules. Anyway, back to the Auxiliary Police… I thought he was an egomaniac snob, he didn’t care for me much either. We settled in the suburbs less than an hour northwest of the city and began our family. Shortly after the birth of our daughter, I pursued a free-lance writing career and worked out of a home office. As a teen-ager I had written a few articles for a weekly Bronx newspaper and had since dabbled in poetry and pieces of prose just for the fun of it. After our son joined the picture, I managed to convince a few more rags to print my articles. This was about the time I had a weekly column as “Bonzo, the Ape” and shared profound thoughts on life. Since then, I’ve written more commonly as myself, sometimes conducting interviews (and trust me, you wouldn’t believe the things people sometimes tell you about themselves! ), covering Grand Opening events, researching new trends and fashions, writing advertorials and business profiles, and just about anything else that will sell. I also spent a few summers teaching Creative Writing to kids in a local program. Both my husband and I joined our local ambulance corps as volunteers and went on to become New York State Emergency Medical Technicians. I’ve helped to deliver babies, did CPR during codes, pulled people out of car wrecks, splinted broken bones, monitored the vitals of drug overdoses, stopped bleeding, and held patients’ hands enroute to the hospital. Both of our kids have followed us into the E.M.S. community and, often, dinner conversation at our table is not for the weak of stomach. Many of our friends are also involved with the local emergency services, medical and fire, and it isn’t unusual to have a festive holiday party empty out as soon as a pager goes off. The stories we swap are never boring. My daughter and my son have justified every gray hair I’ve gotten. They’ve kept me on my toes, made me laugh, made me shake my head and cry, shared their dreams with me, allowed me to boast about them, and have each become a vital part of my inner circle of close friends. I've done the gamut of class mother, Girl Scout leader, Cub Scout mom, school parents’ association, and advisor in various youth groups. My favorite age has always been whatever age they were at the time. I love it when we hang out together or they invite me to go someplace with them and their friends. Both of our "kids" are terrific adults and I love following their various adventures. I’ve always played a favorite game I call “What if?” whenever I see something unexpected, do something new, or hear about some adventure. I mentally place fictional characters into the setting and then I ask myself what if THIS happens, or THAT? By staying involved in my community, active with my family, reading avidly and even surfing on the Internet, I get a lot of fuel for my overactive imagination. One of the reasons I love to re-read, and in some cases re-post, old interviews is to see how far I've come as a writer. Ideally we should all be learning and growing in our fields and I believe I have ~ and hopefully improved. Jen: Readers, please help me welcome Chelle Cordero to Book Talk. Chelle, will you please share a short bio with us? Chelle: I am a full-time freelance writer with both non-fiction articles (newspapers and magazines) and romantic suspense novels to my name. The younger of two daughters, I was raised in the Bronx (NYC) and studied theatre and drama in high school and college. My parents were very progressive and supportive; they encouraged both my creativity and my individualism. Today I live in the lower Hudson Valley suburbs, married for 33+ years, and am mom to 2 grown offspring’ daughter is married and son has a special gf. I volunteer for my local ambulance corps as an EMT and do my darnedest to try to keep busy and out of trouble. Jen: Tell us about Hostage Heart and where it's available. Chelle: Life was hard after the hurricanes swept through, destroying her parents' home and livelihood...Deanna did the only thing she could do. She moved to New York City, found a job, worked hard, scrimped and saved to send what little she could manage back home to Louisiana to her parents. An errand for her boss - a chance encounter with a crew of bank robbers - a kind man who tried to help her and deserved her courageous help in return... But he wasn't the man she thought he was...no, he was so very much more! It’s available through Amazon in both print and Kindle and at Smashwords in various formats. Jen: At what age did you discover writing and when were you first published? Tell us your call story. Chelle: I “discovered” writing in high school and enjoyed making words work. I wrote on my high school yearbook staff and in college I wrote for my school newspaper. I was about 19 when I wroite a hard news story about a 16 year old boy who had been killed when he came to the aid of a woman who was being mugged - this story was run by both my college newspaper and in a local weekly paper in the Bronx where I lived. It was a rush to see my first professional byline. Jen: How do you approach your writing? Do you plot or go with the flow? Chelle: Actually I create my characters, give them a situation and let them write their own story. Occasionally I will throw them a few extra curves. Jen: How do you pick the character’s names? Chelle: Mostly I pick character’s names that I like the sound of; sometimes I will modify a name slightly if I think it suits my character better. Jen: What’s the most challenging aspect of writing? Easiest? Chelle: The most challenging part of fiction writing is typing “The End”. I wind up getting so involved in my characters’ lives and suddenly I have to put them back into a manuscript and get all business like and start promoting my story to a publi8sher and eventually to the public. Like a mom often finds it hard to cut the apron strings, I find it difficult to let go of my characters. The easiest part of writing is allowing my characters to become real and working with them to create a story. Jen: What’s the most rewarding aspect? Chelle: When someone reads one of my books and then after either writes to me or leaves a review somewhere and expresses how much they enjoyed the book – then they follow it up with comments about my characters and emotions and it just seems the really “got it”. Jen: Do you do anything special to celebrate a sale, new contract, or release? Jen: What five authors or people, from the past or present, have been important to you as an author? What question or comment have you always wanted to say to them? Chelle: I think I would just tell each person what they have meant to me in my writing career 1) Daisy Alden- Ms. Alden was my creative writing teacher in high school and encouraged me to use words to communicate and get inside people; she was also a published author and poet and she inspired me since she was the first “real person” I knew to have books in print. 2) Hank Spallone- former NYPD Detective and eventually Yonkers Mayor. Hank was the liaison between the community and the local police and I was an Auxiliary Police Officer that had the wonderful opportunity to shadow him and learn the true importance of communication. Hank was certainly my mentor. 3) My sister Bobi Du-Bois, she has always told me “you can do it” and has managed to be there just whenever I need an ego boost. 4) Barbara Moroch – she [was] an editor with my local newspaper and I have had a wonderful and long term working relationship and friendship with her for almost 2 decades. 5) Kimberlee Williams – she is the managing editor at Vanilla Heart Publishing and believed in me with my first manuscript, Bartlett's Rule and each manuscript since. Her enthusiasm is definitely the “vitamin” every writer needs. Jen: If Hostage Heart was made into a movie, which actors would you choose to play the hero and heroine? Jen: Most people only dream of becoming a published writer. Now that you’ve accomplished that goal, is there anything else you dream of doing? Jen: What do you do in your free time? Chelle: I don’t know if I really have what you call free time. It certainly isn’t that I work all of the time – I enjoy writing so much that it is hard to realize (most times) when writing for work and writing for pleasure begins and ends. As I said earlier in my bio, I also volunteer to ride as an Emergency Medical Technician with my local ambulance corps where I also sit on the Board of Directors. Then, and this is certainly NOT in order of importance, I try to spend time with my family (hubby, son & his gf who live at home, my daughter and her hubby who love nearby, and 3 rambunctious cats). Jen: What's next for you? Chelle: I just want to keep writing and maybe one day get on some best seller lists for my novels AND maybe a Pulitzer for my non-fiction articles? Who knows, I believe that anything can happen. Jen: Where can you be found on the web? Jen: Is there anything you’d like to ask our readers? New Muse on Monday Welcomes Chelle Cordero! 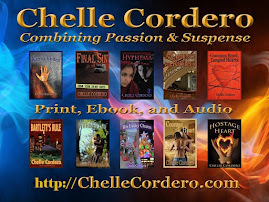 Please give a warm welcome to author, Chelle Cordero! Chelle will be talking about her latest release Common Bond, Tangled Hearts. Writers write about the “what if’s” and “if only’s” – we write of lives that could have been different if only a different set of events occurred. “Happily Ever After” means that thingsalways work out anyway. In real life things don’t always seem to work out the way we want, but maybe they do work out for the best. For all of the wants and desires, everything that happens to us makes us who we are and leads us to do what we do. So maybe things never were supposed to be different after all. There have been things in my life that I thought I had planned out, career choices, even romances – and things happened out of my control to change my path. I studied theatre and drama determined to be an actress and decided I didn’t have the necessary commitment . Then I tested for the NYPD and did very well, but that was the 70’s when there were huge budget cuts and layoffs. Other job experiences, some very interesting and lots of fun, and finally the desire to work from home led me back to my passion for creative writing. Not what I had planned, but oh so very happy doing it. And while my dear hubby isn’t the first to have proposed to me – or even the first I considered – he was the only one I accepted. So at one time my dreams were different until things I saw weren’t as desired as I thought they were. I had even known hubby for a while before we became involved and hadn’t once thought of making a life with him. But “events” threw us together and boy did I ever make the right choice. Perhaps the others I considered helped me to see who I really wanted to be with. “Hey Layne,” He caught her hand. “Talk to me. Tell me about you.” He felt a need to be close to her. Justin didn’t feel at all surprised that he wanted things to work out between them. “Come on, everybody has dreams.” Whether they get to follow them or not is a different story. He paused for a moment. Justin knew so very well how difficult things had been for her. She had told him about being bounced around between foster homes. She had also told him how she met Charlie. “And now, Layne, do you have dreams now?” He sounded so serious. Chelle Cordero is a multi-published author with Vanilla Heart Publishing and a full-time freelance writer with local and national newspapers and magazines. She resides in New York’s Hudson Valley with her husband, family and three spoiled pussycats. 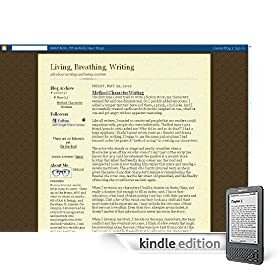 In addition to her books and articles, Chelle pens a weekly writing course available by subscription at Amazon Kindle Blogs http://bit.ly/Wmg8W and volunteers with her local ambulance corps as an EMT. Davie slept only fitfully through the night. It hadn't taken her long to realize that this was the first time she was sleeping without Adam by her side since he had come home from the hospital. By the time the morning sun cast enough light, Davie got up as quietly as possible and changed into her jeans and a man's flannel shirt. She carried her loafers to the door. Davie tiptoed downstairs. Everyone in the house was asleep. She opened the door to Adam's room and peeked in. "I must have finally fallen asleep…" He whispered from the couch which was made up like a bed. "I'm having a wonderful dream. You're here." "Good morning." She hurried in and kissed him. "Get up, come with me." She smiled seductively. "Trust me." Davie waited silently in the kitchen. It didn't take long before Adam was by her side wearing jeans, T-shirt and sneakers. "Come on." She took his hand and led him outside through the kitchen door. It was chilly, a layer of frost covered the ground. They moved quickly along the side of the building until they came to a door. Davie pulled the door open slowly to minimize the squeak of the hinges and pulled Adam inside with her. "What is this place?" He asked. She had pulled the door closed behind them. A small dirty glass pane above the door let in just enough light to see the small cubicle. An old wash basin hung off the wall; it had obviously not been used for a long time. "I think it was originally meant to be a laundry room. When I was a kid it was my secret playhouse." She put her arms around him in the tight quarters and kissed him. "Mmm, good morning." He held her and kissed her back. "I missed you all night." "I know." She slid her hands under his T-shirt. "Show me how much." He nipped at her ear lobe with his teeth and caressed her through her shirt. "How did I ever manage to get so lucky to tap into all this passion you have bottled up?" His breathing quickened when he felt the erect nub through the flannel. "No bra?" He stepped back and made a show of unbuttoning her shirt. Adam weighed her rounded breasts with his hands and bent to suckle each one in turn. Davie ran her fingers through his hair as she held him tightly against her. He backed her against a wall and knelt before her. He placed tiny kisses on her belly as he unsnapped her jeans to pull them down her hips and legs. Once again, he realized that she had worn no underwear and he felt his pulse racing. Kneeling before her, he tasted every part of her as she was exposed to him. "Oh, Adam." Davie's breath was coming in short spurts as she felt his very intimate kisses on the inside of her thighs.